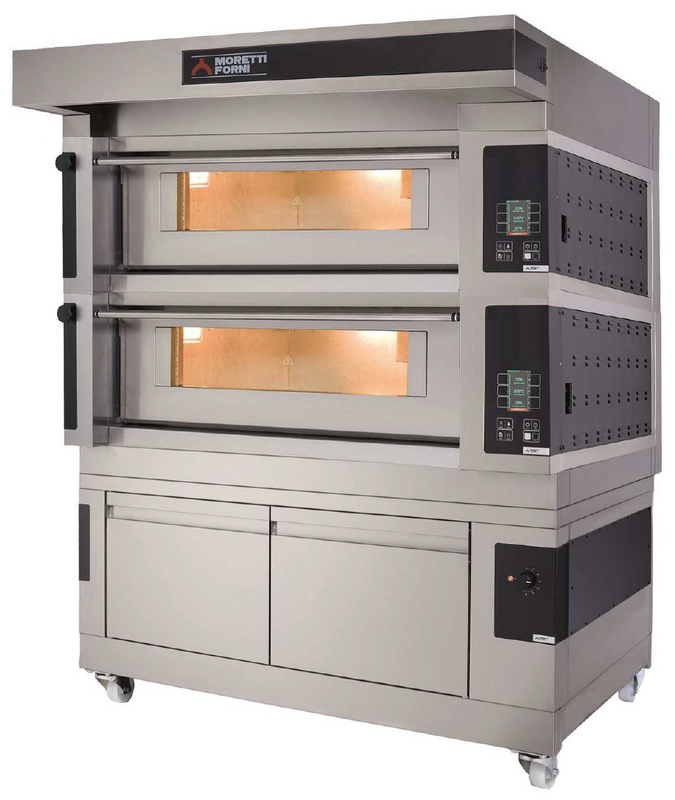 SerieF-Fanbake is the brand new range of convection ovens that elevates Moretti up to the best quality and technology level in terms of bakery ovens production. It represents the finest technical solutions for cooking uniformity and energy savings: produced with particular attention to design and performance, serieF captures the vast experience of Moretti in treating dynamic heat flows using high-quality materials for the maintenance of a low temperature on all the external parts of the oven. F50E is the most compact version of the serieF range. Ideal solution for bakery, little traditional pastries and frozen products, F50E is a 5-tray 60x40 versatile electric oven, also available in the double baking chamber version. It is equipped with double glass athermic door, smooth control board for easy cleaning, sophisticated electronic with white brite displays and inside shell in stainless steel. With F50E it is possible to manage up to 200 programme, with 3 sprays in the same baking cycle. The ventilation is alternated and it is also possible to adjust the amount of steam to put on the product. Top line bakery oven, with a particular attention to containing costs. Please explore all possible combinations. Cutting edge materials and innovative coibentation systems have reduced at the minimum energy dispersions towards the external. The electronic control is easy and intuitive thanks to the colour, user-friendly graphic display. The exclusive Moretti Forni baking process unites 70 year of experience with the most modern and performing technologies, such as the separate managing of top and bottom power with the automatic regulation of the energy needed, according to the quantity of products to be baked. With the Booster function for pick times and the eco-Stand by for breaks, serieS is the right oven for any kind of needs. serieS has an unmistakable style: revolutionary design, stainless steel and smooth surfaces for an easy cleanliness and an excellent internal visibility with double lighting. Moretti Professional: a complete range of electric ovens expressing the highest level of integration between form and function. Reliability, maximum productivity, a high performance baking chamber, excellent components and construction materials are the range main features.